To say there's been a recent upsurge in Tunnels and Trolls activity would be an understatement. In the past year a bunch of new T&T oriented blogs have cropped up and new writers have been coming out of the woodwork. On such person is Dan Hembree, who runs the Lone Delver blog - one of the best Tunnels and Trolls sites on the net in my opinion. Dan has written four solo adventures so far, all which can be bought from RPGNow or Lulu. 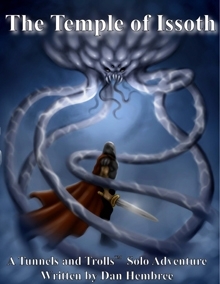 The Temple of Issoth is his free-to-download book (I also bought the physical copy because that's how I roll) for low-level delvers. The adventure is a testament to the energy this new generation of writers have brought to the game, although there are hiccups now and again. The Temple of Issoth is designed for 7.5 but like most other adventures can be tweaked to suit 5th edition. The gist of the story is that a man has hired you to rescue his son from the priests of Issoth, who are to sacrifice him to a Lovecraftian god. It's beneficial to map out this solo because it's quite easy to lose your bearings. Dan has done a great job of making the dungeon as free-roaming as possible, allowing you to go back and forth through rooms. Because guards are roaming the temple all the time you'll be flipping back and forth to the 'guard combat' paragraphs. These encounters are almost always random but expect to fight them multiple times. This really brings us to the downfall of an otherwise well-made adventure: lack of variety in enemies. There are guards, priests and ghouls as well as the final encounter (which is very cool), but the lack of a random encounter table makes enemy types feel constrained. However, Dan has clearly gone for a themed dungeon and he's definitely pulled it off. There are three pre-generated characters at the back of the book if you want to dive right in, which is a nice addition. The illustrations throughout are well-drawn and evocative of the setting and includes some nice work by veteran T&T artist Jeff Freels as well as others. If you survive then you're going to come out much richer than you went in, which is always a bonus in solos. Overall The Temple of Issoth is a great themed dungeon to explore and plunder. Just watch out for the tentacles! Scott, thanks for the review and your kind words about my blog. I did try to keep the variety of foes to a minimum in the adventure, partly to keep the number of paragraphs low and also to maintain the theme of the adventure. I just couldn't justify a diverse horde of wandering creatures in an actively used temple. Perhaps in future Issoth-themed solos I will introduce your dwarf to some of his other, less forgiving minions.